We’re a family run business focused on delivering a fun, cultural, and personal beer experience. Our goal is not only to show you and your friends a good time, but to get you excited about microbrews and craft beer culture here in the Czech Republic. We believe great beer is meant for everyone. Our team is made up of dedicated and enthusiastic beer lovers, all of whom we’re very proud to work with. Come join the fun and let us share with you all the wonderful things about Czech beer culture that we’ve come to love! Trained as an artist and then English teacher, Sarah creates our tours, degustations, and is in charge of our business operations. 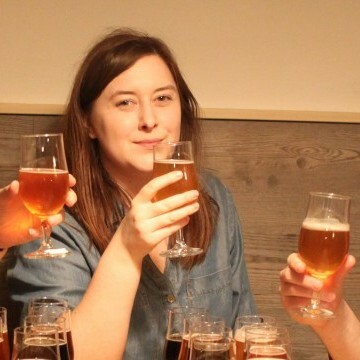 A native Ohioan, Sarah’s curiosity in beer was sparked when she lived in Žižkov, a beer filled Prague neighborhood. As lead guide, she firmly believes that great beer is meant for everyone. 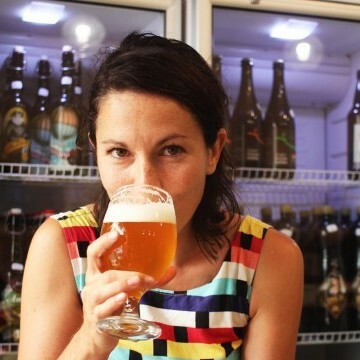 Sarah loves to try new beers, and says ‘I’ll try any beer once, but the good stuff, I’m down for some serious mugs’. Having said that, she admires the complexity of beers like Orval and the tartness of sours, but happily returns to a properly poured mug of Pilsner Urquell. 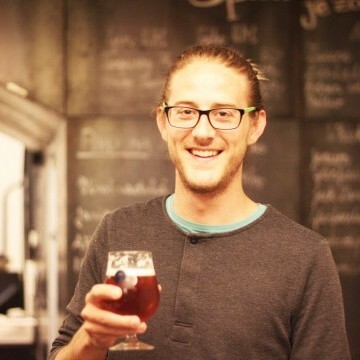 The founder of Prague’s Pub & Beer Guide, Daniel is originally from Gävle, Sweden. His Czech roots are perhaps the explanation for his unquenchable thirst for light Czech lagers, which he no doubt inherited from his father. Daniel is our handy web-developer and online marketer. He’s always thinking of how to make our site easier to use, adding new features, and updating our design, most definitely with a mug of microbrew lager in his hand. For Daniel’s favorite pub, ambiance is key. Daniel appreciates pubs with an upbeat vibe, and the best are ones that combine the cavernous Czech cellar bar with an American party-like atmosphere. A country boy assimilated to city life - Sam was born on a community farm in western MA, raised in Nigeria, grew up in the Shenandoah valley of Virginia and then migrated North to Bar Harbor, Maine. Beer is one of the many pleasures in life that allow him to feel connected with the regions that surround him. As much as he enjoys discovering new IPA's, he says, "I find lots of frustration looking for the right one, they're becoming too experimental and overrated". But no matter what season/occasion, he simply loves a crisp, fresh saison or proper pilsner. For a proper pub, ambiance is key. Besides the food menu, the two most important things is a rotating tap and music, although a jukebox never seems to be inviting. A lover of linguistics, literature, gardening, and connoisseur of beer, Joanna originally moved to Prague to study Czech language and literature. If she’s not on the prowl for Prague’s newest and coolest venues, she’ll be found at home with a cozy cup of tea and good book. 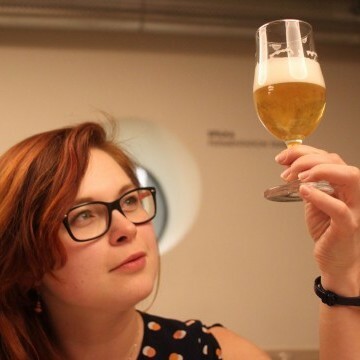 When contemplating her favorite kind of beer, Joh says, ‘I think at this point I've come a full circle; from my initial love of Czech lagers, through the hoppiness of ales and IPAs, as well as absolutely surprising world of lambic, I'm back with a lager in my hand. If I had to choose one, I'd go simple - with Únětická Dvanáctka, unfiltered and unpasteurized.’ As for a good bar, she wants rotating taps, fridges overflowing with choice, good music and furniture, but she astutely observes that all of that jazz is meaningless if the right people, clients and staff, aren’t there to enjoy all of these things, ’All good bars have souls’. We're happy to answer any of your questions! We'll get back to you shortly! Name * Please fill this out, it's required. Surname * Please fill this out, it's required. Your Email* Please fill this out, it's required. Phone Number * Please fill this out, it's required. Subject * Please fill this out, it's required. Please fill this out, it's required.